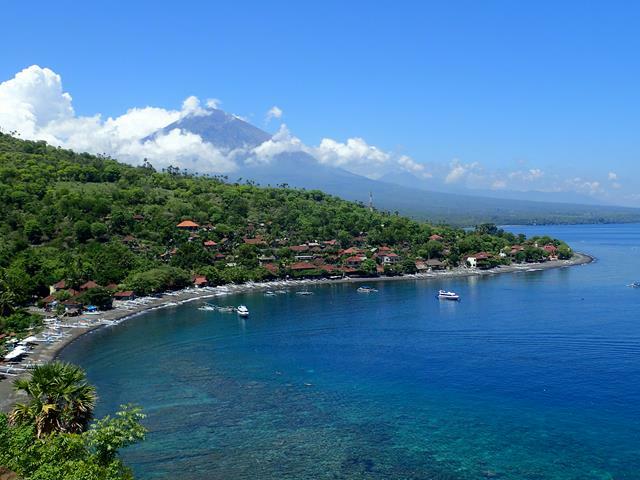 Amed is a small village on the north coast of Bali which is most popular for snorkeling and some of the best scuba diving in Bali. There are now lots of hotels and beach resorts to stay in Amed. The waters along to coast of Amed are crystal clear and there is a large variety of marine life. The sand on the beaches of Amed are a dark sand, almost black due to the volcanic activity from Gunung Agung volcano (seen in the background of the picture to the right). There is just one road that travels through Amed. From the main road that travels along the north coast of Bali, you turn off onto this small road that travels through Amed, the only traffic in Amed is people going to Amed, it is one of the most peaceful relaxing villages to stay in Bali. There are alot of hotels and resorts in the main town of Amed and more located a few kilometers away along this coastline. Check out a list of the hotels in Amed. There are plenty of good restaurants in the main town of Amed which offer a pick up and drop off service to your hotel. From Kuta it will take around 3 hours to drive to Amed. From Sanur it will take around 2.5 hurs to drive to Amed. 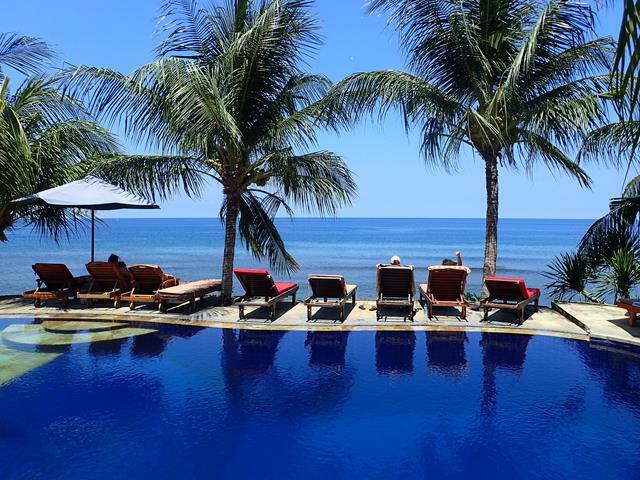 On the way to Amed from the southern areas of Bali, you must stop in at the Water Palace which is just after Candidasa. The Water Palace is around 30 minutes drive from Amed. Also a good short trip from Amed is a short drive to Gunung Agung to visit the Mother Temple which is the most sacred Hindu temple in Bali.